The blue wave some Democrats hope for has to be big enough to top the red seawall that protects Republicans. The Democrats don’t need a wave in 2018 — they need a tsunami. The two big political parties are often presented as equals, each in position at any given time to prevail in an election. 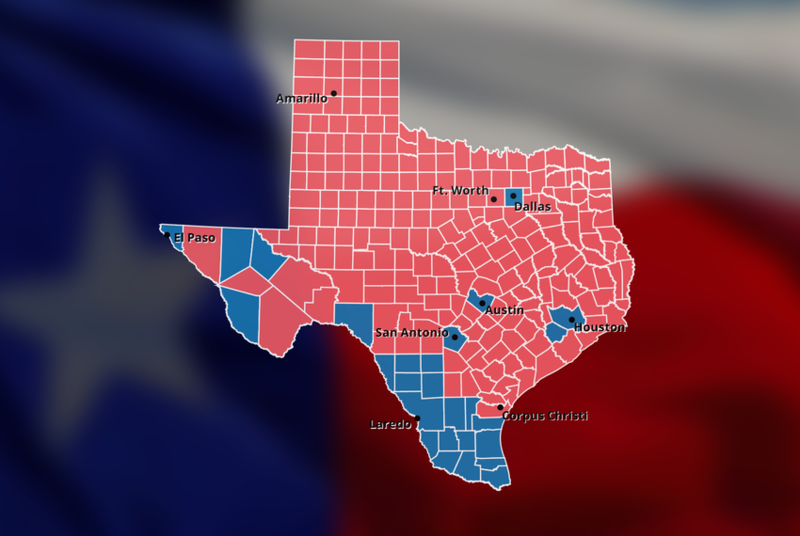 But the Republican Party in Texas has been bigger than the Democratic Party for a long time, and unless hundreds of thousands of new people show up or huge numbers of the majority party’s voters decide to change sides, statewide victories will keep going to the red team. The arithmetic is straightforward. In the 2016 primaries, 2.8 million Texas Republicans showed up, while only 1.4 million Texas Democrats — just a little more than half as many — turned out. That year’s runoffs were anemic, but the Republicans still pulled twice as many people to the polls. In 2014, without a presidential race topping the ballot, 1.36 million Republicans came to vote in the primaries. At the same time, only 560,033 Democrats turned out. The numbers have been like that for years. They vary depending on whether candidates are competitive, what issues are on the ballot and so on. But with a few notable exceptions, more Republicans than Democrats show up for primary elections in Texas. The biggest recent exception came a decade ago, when Democrats were deciding between Barack Obama and Hillary Clinton. That year, almost 2.9 million Texans voted in the Democratic primary while Republicans drew only 1.4 million. Big fights draw big crowds. But the tough numbers persist in statewide general elections, where Republicans have compiled an unbroken record of wins that dates back to 1994. Those wins – the longest such streak in the country – and the political engines that power them have had a trickle-down effect. It took Republicans less than a decade after they started dominating statewide elections to win majorities in the Texas Senate, the Texas House and the state’s congressional delegation. Those majorities were able to solidify the GOP’s advantage by drawing district maps that favor their side and hobble Democrats. In a recent analysis of the state’s congressional maps, the data-centric news site FiveThirtyEight found that, of eight alternatives, the current maps are more favorable to Republicans than all but five other maps. But even the least partisan maps gave Republicans the advantage. One was designed to conform to the state’s political climate — and Texans, over the last two election cycles, have favored statewide Republicans over statewide Democrats, giving the GOP more than 55 percent of their support. Even if they conquer redistricting in Texas — the state’s congressional and state House maps are still being litigated — Texas Democrats still haven’t won the hearts of the majority of the state’s electorate. Democrats are boasting that this year they’ve got more candidates running for more races than usual. The old adage about door prizes — that you must be present to win — is especially true in politics. Texas Democrats now have the candidates in place, should the political climate turn their way. Their hopes lie right next to Republican dread: That the first mid-term elections for Donald Trump might bring a backlash. It happens. Obama’s first mid-term brought the Tea Party to the fore, following a pattern that has sobered presidents of both parties. In that 2010 election, Republicans picked up 23 seats in the Texas House, increasing their skinny 76-74 advantage to 99-51. Some of those seats would have belonged to Democrats in a normal election year, but the Republicans had two pieces of luck: They had a good year and they had candidates in place to take advantage of it. Democrats hope 2018 is that kind of year for them. But the top of their ticket is unproven and untested. Prominent Democrats stayed out this year, for the most part. The party has a gang of nine contestants for governor. None has statewide experience. Or celebrity. Or big sacks of campaign cash. It’s not clear at this point that any of them are well known enough to be called a true frontrunner. The Democratic primaries have plenty of contests, but at the state level they don’t feature people who have, at least so far, exhibited the kind of charisma or passion needed to get the party’s voters to the polls. It is, simply put, a bigger political party.